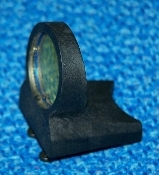 Individual major assemblies of the OKO sights are not available from the factory new. Sometimes, however, I get good to excellent quality new parts assemblies from trade ins than have other problems, but that have some parts in excellent condition. This lens assembly is in very good to excellent condition, This picture doesn't do it justice. It looks brand new.Included with the lens assembly are the four mounting screws. We will give a full refund if it is not up to your expectations, provided if it is returned to us within 30 days of purchase. However, it must be exactly as we sent it out. Any modifications, changes, or damage to the lens assembly, and we will not issue a refund. So, if you buy this part, try it out, and if it does not work for you, just send it back for a full refund. Do not try to remove the lens. If you do, you just bought it! We only have this one lens assembly right now, but we do get them in every so often.